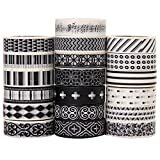 ❤ 【BIGGER, BETTER, CHEAPER!】 ► ARTIT offers the LONGEST Japanese washi tapes on the market - total of 528 ft! Unlike standard cheap tapes that skimps on size, our 16 roll pack is HUGE- 33 feet long & 0.6-inch-wide per roll. Don't compromise for regular 10 ft. rolls, we offer super affordable value kit, premium designs, lively bright colors with uncompromising superiority. Enjoy more of the arts & crafts you love for less. ❤ 【WE DID OUR HOMEWORK】 ► We ensured top-of-the-line quality to tackle all the problems we found in other products: Each tape is made of premium materials & adhesive, sticks on any surface, but easy to peel off or tear, plus it's writable, water-resistant & repositionable - no messy residue left behind. Each roll is sealed & packed separately, it's non-toxic and safe for children of all ages. 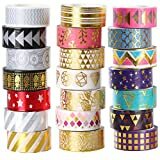 ❤ 【UNBEATABLE VARIETY】 ► A must-have hand-picked unique assortment: Colored, foil, patterned, striped, vintage, modern metallic, floral, gold, silver, white, black, rose, geometric, chevron, bright, shiny, hearts, stars, multicolor or clear! You name it - We have it all! On top that, you get 4 FREE pages-sheets of washi deco stickers! All packed in a stylish gift-ready box that can also be a cute storage, organizer or beautiful dispenser. ❤ 【TRUST YOUR INTUITION, TRUST ARTIT】 ► We took care of every possible negative aspect you might find to ensure you the BEST experience with our set! This is a risk-free purchase as we sincerely believe in uncompromising customer service and stand firmly behind our brand and guarantee you a full, no questions ask, refund if you are dissatisfied. Boys or girls, men or women, young or adults, beginner crafters or artists? After selling 20,000 sets all over the world, we know best - Everybody loves crafting! Make your next DIY project the best with this remarkable washi collection. 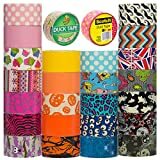 While ordinary scotch washi tapes are undersized & poorly designed, too thin or skinny, low-quality printing, pale colors and weak glue, yours is bright, hand-picked & completely unique - no doubles. 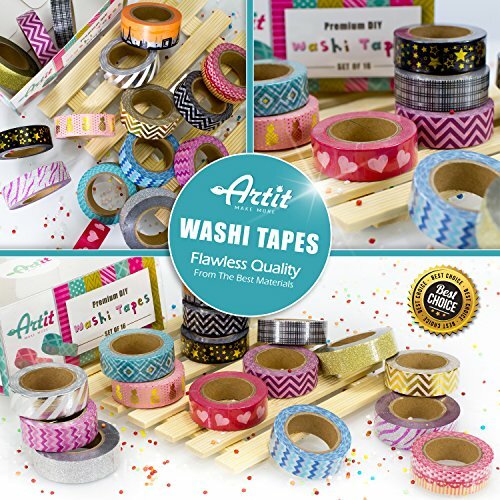 A wonderful washi tape set that offers 16 hand-selected vibrant styles with 33 ft. per roll! TRIPLE the length of others! Versatile, extra-sticky & repositions easily. Even get 4 pages of free stickers! ❤ Teachers? A great classroom activity for the kids! Anniversary, baby shower, birthday, bridal shower, gender reveal, graduation, wedding & engagement. Also give your holiday a festive design - Easter, Christmas, Thanksgiving, Halloween, 4th of July, New Year’s & Valentine’s Day. 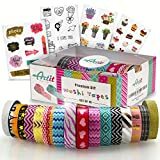 Your washi tape package comes in a gift-worthy box with 4 complementary sticker sheets: flowers, cakes, sign black & white themes.